In watching and chatting with numerous actors and directors over the years, I’ve learned a few things that directors do poorly and several they do well. During this time frame the ideals have changed within the production world, so I’m writing only those key points that relate to actors giving a truthful performance. I hope directors will find these recommendations helpful. TAKE AN ACTING CLASS. Actors are vulnerable and sensitive people who need encouragement and an understanding director. The best way to inspire great performances is by understanding the acting process. To keep up with the latest trends, I take acting or an improvisational class every so often. MAKE A CONNECTION. An actor’s job is intense and exposed, which can cause them to feel overly sensitive or vulnerable. The director needs to come along side of them as a trusted advisor. Actors rarely need to be challenged or have an authority figure bear down on them, as most self-critique or compare themselves to their own detriment. KILL CRITICAL SPEAK. The director owns the set and must stop any cast or crew from saying anything negative to actors. Direction must only come from the director who fully understands the vision and can give proper and affirming recognition. If anyone on the set feels a need to make suggestions or confer with the director about someone’s performance, it must be done in private, if at all. The director MUST protect the actors. ASK QUESTIONS. The last thing an actor needs on set is an authoritarian or a director that bellows out commands or instructions. Each actor is an expert at her character and because the director is focused on everything, the professional actor will maintain that expert status. It’s therefore prudent for the director to change the actor’s performance inductively by asking questions. By drawing the actor into the thinking process, she is able to discover for herself what the character needs to do. This activity strengthens the actor’s ownership of the character and enhances her performance. TREAT ACTORS EQUALLY. An actor’s emotions can take its toll throughout the shooting day. Great directors try to keep an eye on each actor’s emotional status and take specific time to remind her that she is liked and respected. 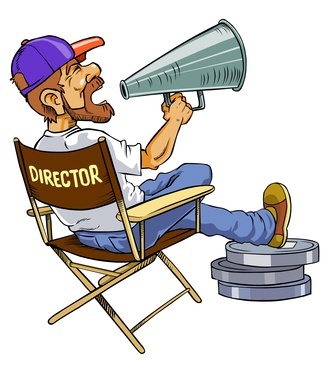 The director is a powerful leader that must share this treatment equally with all actors to maintain a mutually warm environment from which the actors can safely perform. Leaving an actor out of this personalized attention can send her reeling out of control. BE COURTEOUS. Directors can raise the performance bar by being courteous and avoid the common mistake of telling an actor how she blew it. By saying, “What was that? You can’t bellow out your lines. Let’s do another take and give me less,” the director increases the actor’s fear and stiffens her next take. Instead, a director might consider saying, “I’d like to try something a little different on this next take. I wonder if you could maintain your emotional intensity and drench the other character with a dangerous calm.” This gives the actor more to work with and inspires creativity and performance. AVOID COMMON ACTING PROBLEMS. Acting is self-conscious and self-judgmental, which many times can cause an actor to act from her head instead of her heart. The director must work with the actor to make sure she is focused on the character and not herself. This approach will avoid numerous problems that typically rise during any given shooting day and help to draw out an honest or truthful performance. PROMOTE RELAXATION AND FOCUS. Relaxation is important to make sure the actor doesn’t project her voice as if on a stage. It will also impact the way she carries herself. When a scene calls for tension, it will naturally grow from the relaxed state and appear in her hands, walk, voice and face. Anytime anxiety creeps in, the actor becomes stilted in her performance. A director can improve the performance by reminding the actor of what she’s done well. Even redirecting her focus off of her feelings and back onto the character will reduce the temporary lack in confidence. CLARIFY SUBTEXT. Reviewing subtext during rehearsal will help an actor focus on each line, glance or action. Every element of her performance must lead to her character’s super objective or what she is fighting for. The subtext can be clarified with a verb to be played, a character she plays to, and an intended effect that her character wants as the outcome. KILL ANTICIPATION. It is difficult for a director to have an actor play a part “naturally” in a specific way, as the mere mention of doing it naturally makes the performance stilted. Within that moment the actor gets trapped in her head and starts to anticipate a line or action. She might also purposely hold back in an attempt to be more natural, which creates an awkward lag and reveals that the actor has done this moment several before in rehearsal. One of the best ways to avoid this conundrum is to walk the actor through the character’s thinking process, while salting in moment-by-moment clues as the performance unfolds – Just like in real life. KILL INDICATING. It’s common for an actor to increase the visible size of her performance in hopes of reaching the audience or allowing them to see her character’s personality. Unfortunately, the lens is only kind to subtle performance and the actor finds herself overworking and destroying her character in the process. Having the actor think about a secret or some internal struggle during the performance, allows the audience to see that there is more depth to the character without an over-the-top performance. Giving direction to the actor as if you’re speaking to the character also generates this subtle secrecy effect. SPEAK IN VERBS. Many actors memorize certain actions to help them “do business” during their scene and it weakens their performance because it doesn’t naturally flow from the character. Instead of having an actor pull something out of her bag of tricks, the director can share verbs that stimulate creative ideas that develop new actions based solely on the character. An example might come from a script line like, “She keeps up with her dodging in and out of shadows.” The immediate thought an actor might come up with is moving from tree to tree peering around as she tries to keep up with the other character. However, the director can bring to bear an arsenal of variations on this movement by asking the actor to “trail” the other character. Or, he can step up the intensity with each word suggested: follow, track, pursue, hunt, stalk, or chase. Each verb intensifying the action and giving a new mental picture for the actor to perform. If I were to add a “don’t” to the list for amateur directors, I’d have to recommend NOT ever demonstrating how you’d like something played. This act instantly reduces the director’s credibility to zero and he doesn’t get what he’s asks for, as his performance never plays out the way it was in his head. It is also insulting to the actor who is the expert on her character, who would never do things like the director demonstrated. This is not to take away from the director showing an actor their blocking, as he walks the actor down the path, while discussing the character’s motivation. The key is to remember that the actor is an expert at her character and the director can’t be due to his high level of knowledge on the entire picture. However, the director will know what works and what doesn’t and must use questions to help the actor create variations of performance until the director gets what will work best on screen – Something the actor trusts the director to accomplish.